The Perlman Music Program String Quartet appeared on Show 302, recorded in Denver, CO, on February, 20, 2015. 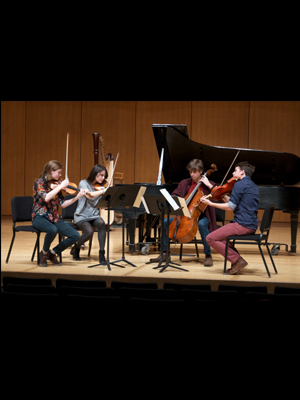 The Perlman Music Program String Quartet was formed at the Perlman Music Program during the summer of 2014. Its members include 17-year-old violinist Alice Ivy-Pemberton from New York City, who previously appeared on From the Top on Show 174 from Boston, as well as on From the Top Live From Carnegie Hall, the PBS Television show, on Season 2, episode 8; 16-year-old violinist Abigel Kralik who is originally from Budapest, Hungary, but currently lives in Brooklyn, New York and attends the Professional Performing Arts School and the Juilliard Pre-college Division; 18-year-old violist Jasper Snow, originally from Houston, Texas, now in his freshman year of study at The Juilliard School in New York City, who previously appeared on From the Top on Show 299 in Montclair, New Jersey; and 17-year-old cellist Daniel Hass, originally from Toronto, Ontario, currently studying at New England Conservatory in Boston, Massachusetts, who previously appeared on From the Top on Show 262 in Greensburg, Pennsylvania.